In part one of this two-part series on pumpkin-based recipes, we ranged in our selections from Pumpkin-Ginger Waffles, Pumpkin and Cauliflower Casserole, Harvest Pumpkin Soup, all the way to Creamy Pumpkin Pasta, which is both vegetarian and “skinny”. While “skinny” might refer to pretty much everything these days, the fact that these pumpkin-inspired dishes are delicious is not up for debate. Before we dive back into more recipes which utilize pumpkins, we’d like to describe some of the food options we have here at Bengtson’s Pumpkin Fest. This year, we have more attractions, more rides, and the most days with the lowest rates in our 37-year existence. We are just a short drive outside of Chicago, so why don’t you come on by before our last day on October 30th? We would love to have you and the whole family visit us, and this year you can get the coupon price without the hassle of the coupon! Check out our Hours and Admission Rates to determine which day(s) work best for you! We have some fantastic carnival food at our pumpkin patch. On top of that, we have a wide range of other options, if funnel cakes and cotton candy aren’t going to hold you over for the ride home. You can find a brief description of each option below. Rogue Curbside Kitchen – An assortment of delicious signature sandwiches are available to you, should you pick the finest food truck experience around! Fresh Apple Cider Donuts – We are talking about pumpkin-themed dishes today, but that won’t stop us from mentioning our Fresh Apple Cider Donuts. Get them in bulk so you can take them home, too! Uncle Bub’s Award Winning BBQ – “Award Winning” isn’t just some empty slogan, it’s a fact. These guys won THE Chicago Ribfest, so you better check it out, if you are any degree of rib fan. Wooden Paddle Pizza – It’s no deep dish, but wood-fired pizza is a nice change of pace, especially when you don’t have to wait 15 minutes or so for your pizza to be done! That’s the beauty of wood-fired pizza. El Taco Cocina – House-made salsas, authentic, gourmet tacos, and great people. We know what you like, and we are pretty sure you’ll like El Taco Cocina. Cotton Candy – Among our fall festival carnival food favorites, cotton candy is a classic everybody enjoys. Our favorite part is watching the smallest kiddos try out cotton candy for the very first time! Funnel Cakes – Another great pumpkin patch food, funnel cakes are a treat which never gets old. Unless you try to eat a couple all on your own, so make sure you share this deep-fried, powdered sugar-coated treat! Kettle Corn – You might be wondering why we are bothering to describe kettle corn, a carnival treat most everyone is familiar with. Well, ours is a secret family recipe, that’s why. Try it once, and grab a couple few bags to tide you over until next year! Pizza and Roasted Sweet Corn – Nab yourself a giant slice of pizza and some locally grown sweet corn while you are at it. The Food Barn – Carnival food central; get apple cider donuts, soda, cotton candy, caramel apples, chili, hot dogs, coffee, apple cider, pumpkin spice cappuccinos, chips, nachos, and more. Toasty Cheese Food Truck – Certainly one of our most popular grilled cheese food trucks, the Toasty Cheese Food Truck offers a grilled cheese sandwich tasting experience which is unlike any you’ve ever had. That is, it’s unlike any you’ve ever had unless you’ve had the Toasty Cheese Food Truck before. Regardless, they make delicious, gourmet grilled cheese sandwiches. If you like cheese, try it out! As you can tell, we are pretty into the whole fall festival food thing. That’s why we thought we would extend this topic out into a two-part series; we couldn’t fit all of our favorite pumpkin-themed recipes into just one post! Keep reading for some more delicious fall recipes with pumpkins at the heart of each! In our previous post, we had another ginger and pumpkin marriage, in the form of sweet waffles. This time, we are going with more of a savory route. It’s an Asian-inspired flavor profile, with ginger, pear nectar, and a note of peanut to accent the pumpkin flavor. It’s a great blend of the expected and unfamiliar. 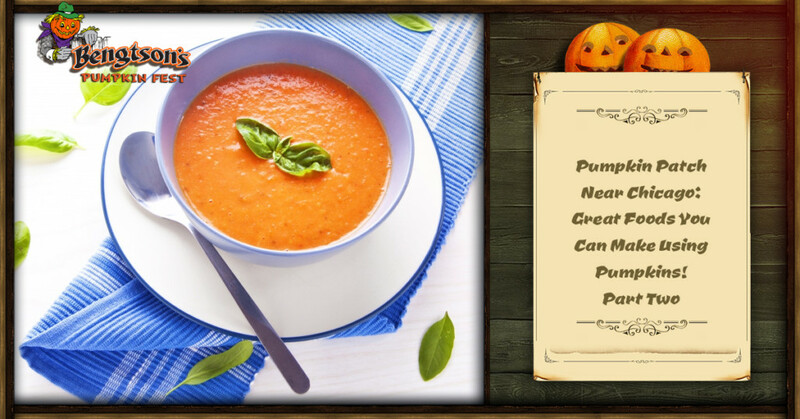 You’ll need pumpkin puree, chicken broth, pear nectar, creamy peanut butter, ginger root, garlic, green onion, lime juice, cayenne pepper, toasted pumpkin seeds, and chopped chives. For specific measurements, see the recipe, found on Country Living. You’ll find the blend of lime juice, ginger root, cayenne pepper, and other Asian-inspired spices to be a unique blend. Enjoy! You’ve probably had honey butter, and you were also probably never the same. Apple butter is good as well, but isn’t as life-changing as honey butter is, in our opinion. When you take pumpkin butter and combine it with a pumpkin risotto, you just might be on to something brilliant. You’ll need one small sugar pumpkin, olive oil, rosemary, sea salt and pepper, chicken broth, yellow onion, chopped garlic, arborio rice, white wine, butter, pumpkin butter, fontina cheese, and Parmesan cheese. Once you follow the directions, you’ll be able to shape the leftovers into 2-inch patties. Once you’ve dusted them in flour and pan-fried them for a crispy crust, you’ll have a seasonal treat that will have any dinner party floored. We (basically) guarantee it! While we are talking about delicious kinds of butter, let’s throw in some pumpkin to the already delicious apple butter. This one might be the most simple of any we’ve listed in this post or the last. You need pure pumpkin, applesauce, light-brown sugar, fresh ginger, ground cinnamon, and nutmeg. All you have to do is stir up every ingredient in a medium saucepan until it is blended, whereupon you can bring it to a boil. Make sure you stir it often. Once this is accomplished, reign in the heat to low to let it simmer, uncovered, for 30 minutes. Keep stirring frequently to avoid burning. Let it go for half-an-hour, or until the sauce is thick enough to be considered a butter in your mind. Let’s stick with the easy stuff. All you need for this quick snack is a few cups of pumpkin seeds, water, salt, olive oil, paprika, and any other spice you think will go nicely with pumpkin seeds, oil, and salt. Take your pumpkin seeds, water, and salt in a large saucepan and put it into a preheated oven at 350 degrees F. Once they’ve boiled for 15 minutes, drain the seeds, blot them dry, and then toss with your favorite spices. Then take the freshly-coated seeds and spread them across a nonstick baking pan. Roast them for 30 minutes until they are sufficiently crispy and golden-brown. Store them in the freezer if you don’t eat them all right after they are finished! Choose from awesome fall festival rides and attractions that include a Free Selfie Booth, a Gemstone and Arrowhead Mining Sluice, an actual pumpkin patch (believe it or not!) a Haunted Barn, a petting zoo full of barnyard animals, pig races that happen multiple times per day, tractor-pulled hayrack rides, a pumpkin chucker for the older kids, multiple railroad train rides, and a bunch of kiddie rides to boot! That’s not all of them, either. We just don’t want to list them all, because they are so much more fun when you can experience them as opposed to reading about them. Suffice it to say that we have something for the whole family here at Bengtson’s Pumpkin Festival. We are proud to have been providing people around Chicago (and really, all around the Midwest) with an annual fall activity that brings the whole family together. Come see us at our Homer Glen pumpkin patch before we close on October 30th!